This page was written by Alison Bailey of the Chesham Bois History Group, with help from Peter Bright, Roger Cook and others. Anne’s Corner seems to have been built during 1910 (probably by J H Kennard) for Ernest Harrison Forwood, a farmer and shipowner from Liverpool. He was living with his wife Margaret and large family at Bendrose Grange (or House?) , Finches Lane off White Lion Road near Little Chalfont. Moving to Amersham Common from Hampstead in 1905 he immediately started to invest in land and property, building a number of houses in Amersham-on-the-Hill and Chesham Bois and was a substantial landowner by the time of his death in 1942. He initially had a dairy at 3 Anne’s Corner (now 5 Bois Lane) although this was soon replaced with the Post Office. Anne’s Corner occupies a prominent position in the heart of the Chesham Bois Conservation area. It is made up of 3 separate properties, 2 cottages and a cottage with a shop, arranged in unusual U-shape at the junction of Bois Lane and North Road and the triangular village green (where the War Memorial is sited) at the east end of the Common. The property was built on plot 22 of the 1896 Manor Farm Estate Auction advertised as a “valuable corner plot of building land with a frontage of 64 feet to the Common”. The land was part of a Manor Farm field called Coach Meadow or Squash Meadow and the Cheyne map of 1716 shows that the drive to Chesham Bois Manor came through here at one time. Arthur Lazenby Liberty speculatively bought a number of plots at the 1896 auction including plot 22. Later that year he sold it on to John Birch (listed as ‘Boot and Shoe Maker & Parish Clerk’ in the 1907 Kelly’s Directory) who lived at Leazefield House (now demolished) almost opposite the land on Bois Lane. He had a workshop on the land but sold it on to Jane Rose in 1903, the wife of George Rose Miller of Chesham Bois. Alfred Gee (a landowner and farmer from Hill Farm, Latimer) bought plot 22 for £65 in 1906. His son Ernest Gee was an architect and they built a number of houses in Chesham Bois. Referenced in the Amersham Rural District Council’s Minute Book 12 April 1910 as 3 cottages, Anne’s Corner seems to have been built during 1910 (possibly by the Gees) for Ernest Harrison Forwood another landowner and farmer, who lived at Bendrose House, Finches Lane, Amersham Common. He owned the whole property as an investment until his death 29 September 1942.He initially had a dairy at 3 Anne’s Corner (now 5 Bois Lane) although this was soon replaced with the Post Office. The design of Anne’s Corner seems to have been part of a plan to establish a new village centre with shops in the early 1900s. It would appear that it was always built as 3 separate dwellings but all built on one single slab of concrete. William Aris had established a bakers shop on the site but had moved this across the road to the newly built Stanley Parade. 1 Anne’s Corner (now 1 Bois Lane) is built on part of these earlier foundations. 3 Anne’s Corner (now 5 Bois Lane) was built with a shop front and in 1911 Miss Lavinia Cutler moved the Post Office across from Holly Cottage, Bois Lane replacing Forwood’s dairy. She was Post Mistress from 1911-1933. Later Post Mistresses included Mrs Clara May Corlett, (1940s) and Vera Clarke (1980s). It remained as the village Post Office until 1996 when the then Post Mistress, Dolly Temple (her husband had a gentleman’s outfitters in Amersham-on-the-Hill, Nancarrow and Temple) bought the grocery store opposite (now Blossom & Grey) and moved the Post Office there. Today a village landmark, Anne’s Corner with its “Vernacular Revival style” has been Grade II listed since 1996. Catherine Murray, the District Historic Building Officer describes it as follows: “The pseudo-vernacular style of the whole building makes a distinctive architectural statement. The style is certainly striking. The ground floor walls are constructed in a chequer pattern of square flint and concrete blocks, as are the chimneys, while the first floor has patterned timber framing that is particularly elaborate towards the front. Leaded light windows and steep clay tile roofs contribute the picturesque effect. Internally the ground floor decoration of the main front rooms (3 Bois Lane) reflects the same pseudo-vernacular theme as the exterior, with applied timber studs and braces, exposed ceiling beams and extraordinary timber fish-scale cladding to the hoods over the fireplaces.” There are 5 clustered flint and cemented brick stack chimneys set diagonally. 1 and 3 have gable ends which formerly had exposed frame but are now tile-hung. Ernest Forwood was obviously considering selling the property in 1939 with the outbreak of WWII. Pretty and Ellis valued the property at £2,450 pounds. 1 was let out at £70 per annum exclusive of rates, 2 at £52 and 3 at £60. The property was sold in January 1944 when Ernest Forwood’s executors sold the whole of Anne’s Corner to Joseph Darvell of Botley House, Botley, Chesham. Joseph Darvell had first visited the property as the local Fire Officer when he was called to put out a fire caused by a stick of bombs which fell locally damaging St Leonard’s Church and other village properties. Read an account from an eyewitness. c 1941 after being re-built following bomb damage. The damage can still be seen on the corner of 3 Anne’s Corner (now 5 Bois Lane) where the property was re-built with red bricks. 5 Bois Lane is still owned by the Darvell family as is the car park to the side. In 1953 Joseph Darvell sold 1 Anne’s Corner to Henry George Tench. The Tenchs had been living there since the end of WWII. Henry Tench had moved his family to Amersham from Portsmouth during the War when he started to work for Rutherford Oil Burners Ltd which was based in a workshop behind Stanley Parade. The Rutherfords lived in 1 Anne’s Court and the Tenchs took over their lease when they moved to Newport Pagnell. Henry’s son David has written his memories of living in Anne’s Corner during 1944 – 1957 (see article below). 2 Anne’s Corner (now 3 Bois Lane) was not sold until 1977 when it was bought by Dennis and Rosemary Sayers. This was written by David Tench in 2007 and is reproduced with permission. See David’s obituary here. My family – the Tench family – moved from Portsmouth, Hants (where I was born in 1929 and where the family had lived for generations) to Amersham in 1943. My father was an engineer; he had always been a marine engineer until then, having been trained in Portsmouth Dockyard and served between the wars (among other things) on the trans-Atlantic liners plying between Southampton and New York. When he retired from that in his mid forties, he worked for the Shell Company and at the outbreak of war in 1939 he was in charge of the substantial Shell storage depot for oil at Portsmouth, on the harbour very near to the entrance (the “sally port”) to Spithead and hence to the sea. Then in 1943-44, his qualifications and expertise as an engineer caught the eye of the Ministry of Labour and at their behest he was required to deploy his engineering prowess for something more needed for the war effort. There was no arguing with this and he found himself required to move from Portsmouth to Buckinghamshire and in particular to a small town called Amersham and in particular to work for and at a small engineering business at somewhere called Chesham Bois. I was then away at school at Winchester and all my brothers and sisters (all older than I was) were in the Royal Navy, doing their bit to further the war effort. I naturally followed my parents to Amersham and when the school holidays arrived, I had to find my way to this strange place called Amersham and found it was very different from life in Portsmouth – less bombing for one thing. None of us in the family thought of this as being a permanent transfer, just one of many upsets caused by the war. I was 14 years old at the time of the move from Portsmouth and when I had completed my three years at Winchester College Choir School my father (through some sort of wangle – he was rather adroit at that sort of thing) got me into Merchant Taylors School at Northwood, and I commuted daily there and back from my home in Amersham for the rest of my schooldays. The family lived at first at 17 Green Lane, Amersham and my father went each day to this small engineering enterprise which he was meant to be invigorating which had premises in Chesham Bois – a small engineering workshop in a row of garages behind where there is now a block of flats and then just (as there are now) a small row of shops – a butcher, a grocer, a greengrocer and (on the other side of the road at that time and next door but one to where we later lived later at No 1 Anne’s Comer), the Post Office. This was the development workshop of Rutherford Oil Burners Ltd the business owned and run by Mr Rutherford, my father’s boss. The interest taken in this little business by the Ministry of Labour lay in the fact that Rutherfords had started to develop a mobile oil burner of a kind which, it was hoped, could be used by the army for mobile kitchens for the purposes of the war effort and made available for the mobile catering needs of the army wherever they might be needed. Old man Rutherford had had this idea originally, and the Army seemed quite interested in it, so they looked round for a competent engineer to assist in its development. And so through the Ministry of Labour the choice fell eventually on my father. I stayed on at Portsmouth Grammar School (evacuated to Bournemouth during the war) and so was living away from home, which was now in Amersham. But my father, having concluded that we as a family were now likely to have to stay in or around Amersham for some time to come, decided that he would try to get me into Merchant Taylors School at Northwood and in this he succeeded and it was there that I completed my education, living at the house in Amersham and commuting daily to and from the school. I then found (rather to my surprise) that my education had been sadly neglected. While at Winchester College Choir School I certainly learnt a great deal about English Church music, I did not learn much about maths, English, the sciences or any other of the mainstream subject then current for most boys in English education. The result was that when I left Winchester in 1943 I could certainly take you through most of the staple composers in English church music, I had hardly a clue about basic maths or English or sciences. My good friend John Penny (who was in much the same boat as I was in this respect, having been with me at Winchester and then at Portsmouth Grammar School at Bournemouth) was like me rather baffled to discover how clueless we were at Portsmouth Grammar School and only later realised that this was due to the rather poor and restricted “education” we had received at Winchester. I stayed at Portsmouth Grammar School for two terms and was then relocated to Merchant Taylors School near Amersham. At both of these schools I found the going quite hard, my education (as I then discovered) having suffered a good deal from the chops and changes due to the war and the undue emphasis on music at Winchester. It took me several years to demonstrate (as my father claimed, rightly as it subsequently emerged) that I was not inherently stupid but the victim of circumstance, brought on partly by the war. Eventually I settled down to life at Merchant Taylors School and did moderately well there. But I was obviously not a scholar. In the meantime my family moved from Green Lane, Amersham to Chesham Bois. Very close to my father’s firm’s workshop at Chesham Bois was Anne’s Corner, Chesham Bois and in Number 1 Anne’s Corner lived the Rutherford family. For some reason (I forget what it was) they decided at about the time of the end of the war (May 1945) to move from Chesham Bois to North Buckinghamshire, to Newport Pagnell, a small market town that is in fact now absorbed into Milton Keynes, leaving No 1 Anne’s Corner, Chesham Bois behind. So Mr Rutherford offered it to my father to buy, probably at a bargain price. By then my father was reconciled to the fact that Amersham was now the family home town and although he might one day return to the Portsmouth area, at least for the foreseeable future his life (and that of his family) was very likely to be in and around Amersham. So he agreed to buy 1 Anne’s Corner from his boss Mr Rutherford and the Tench family settled to its new life in Chesham Bois. This was in about 1946. I was still at school at Merchant Taylors School and I quickly developed a very active social life in Amersham, centred on my family home at Anne’s Corner. I soon came to know a lot of young people in that area (particularly girls, who now started to have a magical appeal for me) and I began to lead a life of utter joy and happiness, revolving largely around my many friends in and around Amersham and in particular Chesham Bois. It was with an existence centred on an active social (ie love) life in Chesham Bois, plus life as a law student at the Law Society’s School of Law in Lancaster Gate London that I happily lived my life as a young adult. It was a lot of hard work but it was also bliss. One of the friends I developed at Merchant Taylors School was Roger Gilbert. He lived in North Road, Chesham Bois with his family (his father was a senior Treasury official, Sir Bernard Gilbert and I dare say I let it be known that my good friend Roger had parents who were Sir Bernard and Lady Gilbert, but that is how I was at the time). Life in Chesham Bois at that time started to take on a golden glow. Originally through my friend Roger Gilbert, but later through my friend John Meier from Amersham and from many others, I came to know reams and reams of young people. And we had a lot of fun. Every Saturday morning, a gang of us met in the shops in Amersham-on-the-Hill and congregated at Cherry’s coffee shop. We more or less took it over mid- morning on a Saturday and I imagine made an awful lot of noise. One of the waitresses there at that time was Mair (pronounced Myra) Redding, then a young woman and she was very tolerant of our noisy behaviour. Her acceptance and tolerance of this invasion by young people every Saturday morning made a considerable difference (as we can now see) to its continued functioning. Mair Redding, now aged 86, still works for us in our house in Old Amersham and remembers those days as I do, with amusement and pleasure. Up to about 10 or 12 of us used to assemble at Cherry’s for this ritual and when we had devoured enough coffee at Cherry’s, we decamped down the road to the Station Hotel (alongside the station at Amersham). It subsequently became the Iron Horse and was demolished about two or three years ago and a block of flats has been built there. In the Iron Horse the Chesham Bois young set continued their habitual revelries, playing shove halfpenny and making half a pint of beer eke out to fill the time before we all had to go to our homes in the district. This group of young people became the “smart set” of Chesham Bois at the time. In the summer we met as a gang in the evenings on Chesham Bois Common or in someone’s house and garden to do the sort of things that young people get up when they meet together, the world over. In the winter months, we were more restricted. But we did like popular music and dancing, when we could. One day, we heard that the rather staid bridge club held at Longlow House in South Road, Chesham Bois (now Guido’s Restaurant) and at the time – as now – diametrically on the opposite side of Chesham Bois Common from Anne’s Corner, was embarking on a series of monthly dances for young people on Saturday evenings. This seemed to be something up our street and we began to go to these dances. They were pretty informal and disorganised but fun. Before long, Mrs Marjorie Dixon, who presumably owned and was definitely in charge of the Longlow Club and who was running these dances (and making a bit of money out of them, I suppose), noticed this gang of young people invading her monthly dances and in particular she noticed me and my friend John Meier, who seemed to her to be at the centre of the group who seemed to be in the habit of coming to her dances at the Longlow Club. So she approached us and asked whether we would be interested in running these dances for her – choosing the records to be played, playing them and generally being in charge of the event. She would continue to provide refreshments (not alcoholic) halfway through and collecting the cash from the visitors (3s 6d per person then, I seem to recall) but otherwise John and I would be in charge of the rest of the arrangements, in return for which the two of us would be allowed to get in free. This seemed like a good bargain to us. John took charge of the music, choosing and playing the records while I (already the big talker and full of smug self confidence) became the natural MC. And that is how it worked out. We had a good time at no expense to ourselves once a month on Saturday evenings and attracted quite a crowd of our friends (especially girls) to these occasions. And so we all had a great time. The Longlow Club dances became a central focus of our expanding social (and love) life and we had a lot of fun. We met a whole lot of new people, mainly girls, who included Mary Rose Hall (who lived in Devonshire Avenue in a grand house belonging to her solicitor father) and her best friend, Jeanette Sterk who was by a very wide margin the most beautiful and attractive of the many girls who flocked around us around Chesham Bois in those days. I should add that I had first met Jeanette Sterk through her brother John who was at Merchant Taylors School with me and whose family lived then in Chesham. John Sterk is still very much a good friend of mine. Going back to the period just after the end of the war, in the late 1940s, my mother lived at home in Anne’s Corner while my father went off to work every day in his car, leaving my mother at home obviously. She never learnt to drive and there was not any question of having access to a car or anything like that. She did some of her main shopping in Amersham shops presumably, hauling it home on foot. But much of her shopping was done in the little shops close by the house in Chesham Bois itself. There was Mayos the butchers, and general grocers, Hances the greengrocers and the Post Office at the other end of Anne’s Corner itself, run by a sweet old lady and friend of my mother’s, Mrs Corlett who was helped in the shop and the Post Office by a lady known as Dory (short for Dorothea presumably) and they sold postcards, and trinkets and picture frames and many such nick-nacks in their Chesham Bois shop of which the Post Office was part. One of the other shops in Chesham Bois adjoining the ones already mentioned was run by a rather shy and peculiar man who used the shop as a recording studio. He made old fashioned vinyl records for profit but I doubt whether he had much custom in this rather remote and rural location; demand must have been very limited for such a specialist service. Of course, this was in the days before tape recorders let alone all the modern means of recording. To have a record made of yourself was a most unusual event but somehow this chap managed to make a living at it in his little place in the middle of the Chesham Bois shops. We made a record there one day, just for fun, we being myself and John Meier. One thing we started to do together was to sing songs together as a pair. This was in a style popular when done professionally and was often a feature of reviews taking place in the West End theatre. I played the piano and we sang together and we wrote the songs. I did most of the lyrics although John joined in this to some extent and I composed and played the music. We had a lot of fun doing this and our performances became a feature of the dances at the Longlow Club and elsewhere. It was songs from this quite extensive repertoire of our own songs that we recorded (just to see what we sounded like) at the Chesham Bois studio opposite our house at Anne’s Corner. Also living as one of the family in our home at Anne’s Corner was my sister Molly. She had been an officer in the WRNS during the war and had done very well. After the war, and without any qualifications as such but her distinguished record in the WRNS, she took a job locally and became the first librarian at the Radiochemical Centre at Amersham Common (now part of the great international organisation GE Healthcare) which had been set up there during the war as an offshoot of the government’s national radioactivity (including the atom bomb) initiative at Harwell with a view to developing the isotope side of their activities. Thus the Radiochemical Centre started its first existence and Molly Tench was its first librarian. She worked there as such and very happily until several years later she married John Argent and moved to the south coast. Molly was a magnificent organiser – she could organise anything. She soon became involved with the local amateur theatrical group, the Amersham Playgoers. This was an offshoot of the Playhouse Theatre, Amersham where at that time a quite successful professional repertory theatre operated – the Amersham Playhouse, in the building which is still there and which is now auction rooms. It lies just below the bridge on Station Road, close to Amersham Station. Molly became a big influence in the supporters group which the Playhouse generated and which set it itself up not only to support and regularly attend performances at the Playhouse Theatre but itself to sponsor and put on theatrical performances as an amateur group. Molly was very good at this sort of thing (several people remarked that she was the world’s best stage manager) and the Playgoers became an important part of our Amersham life at that time. I became dragged into the Playgoers and their performances from time to time – not only was I a young male (always in short supply in an amateur theatrical context) – but I was Molly’s brother. So inevitably I became involved but not nearly as much as she was. Chesham Bois as such was not much involved in these activities; they were centred on Amersham, although Molly used to use the large sitting room at the front of the house at No 1 Anne’s Corner in Chesham Bois for rehearsals and such like in connection with her Playgoer activities. Hence there was a lot of coming and going to the house. Molly was involved in many other activities around Amersham and Chesham Bois in that era. She was, for instance, one of the two people who were responsible for the establishment of the Amersham Community Centre in Chiltern Avenue, Amersham – then a derelict set of old farm buildings. She and a local councillor spotted these old buildings, Molly had the vision (very typical of her) to see how they could (with a good injection of finance) be turned into a community centre and so become a centre for local social and cultural activities. 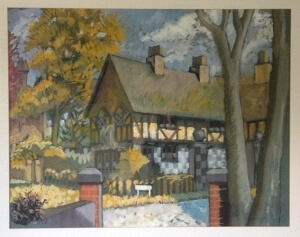 She managed to put over her ideas on this to a local councillor who then managed to interest the local authority (then presumably the Amersham Rural District Council) and thus was created the Amersham Community Centre, still the flourishing hub of district cultural and learning activities. I have no doubt that Molly conducted a good deal of the negotiation and meetings leading to this inspired creation from the family house at Anne’s Corner in Chesham Bois. l remember a little of some of the characters who lived in Chesham Bois close to us in Anne’s Corner in those days – 1946 to 1952. One of the large houses overlooking Chesham Bois woodland triangle near Anne’s Corner – it is called now as it was then Heathfield, I think – was inhabited in those days by a very nice couple, Harry and Lynn were their names, I think but their surname I have forgotten. They emigrated to Australia soon after that time, I believe. Then there was that fellow we all called Johnny – what is his other name was I have forgotten; he lived with his family in Bois Lane, a bit further down near the church, if I remember rightly. The only reason for remembering him at all revolved round an incident he caused around 1950, perhaps. There was a story published in the Bucks Examiner about the discovery of a piece of Roman pottery in the district, on which stray letters from the original inscription could be made out. At this our friend Johnny wrote to the Bucks Examiner to announce that he had found a fragment of pottery locally on which a Roman inscription could clearly be made out. This was (according to Johnny’s letter) as follows: “ITI SAPIS SPOTANDI TISA BIGONE”. Readers were no doubt duly impressed to read this. We who knew Johnny and his irreverent sense of humour suspected that he was up to some mischief. And so it proved. The alleged inscription could be broken down thus: IT/IS/A/PISS/POT/AND/IT/IS/A/BIG/ONE. We his friends knew the secret and laughed heartily together at the embarrassment caused to the Bucks Examiner. When they discovered that the letter from our Johnny was bogus and what he was suggesting what the alleged inscription on his fragment of pottery was, they were not amused and apologised to their prim and proper readers. Such were the joys of youth in those days. Life for most of the inhabitants of Chesham Bois in those days was quiet and orderly. Everyone was polite to everyone else, everyone voted Conservative (the local Tory MP was Mr Ronald Bell an ultra right wing old fashioned Tory as I later discovered), the man in many families (like me) commuted to London by train each day (naturally I walked to and from Amersham Station from Chesham Bois every working day), we listened to the radio (mainly the BBC Home Service in the case of my parents and the BBC Light programme for me). There was no commercial radio and no TV. Nevertheless, life in Chesham Bois was exciting and enormous fun for a 20 year old young man like I was. I was obliged (like every other young man) to do national service. Because I was studying law in London with a view to becoming a solicitor, my national service was deferred until I was qualified. So while many of my contemporaries were serving their time in the army or the air force, I was stuck at home with my studies. But all the time I was also living it up in Chesham Bois and Amersham. I remember how I used sit up on the sill of one of the two front windows at Anne’s Corner, especially on summer evenings, idly reading a law book but looking out on to Chesham Bois war memorial and watching the people of Chesham Bois go by. Sometimes it would be someone I knew and I would call out a greeting. Sometimes I even abandoned my studies for the day and went off to do something with one of my friends. But I must have absorbed some of the legal learning from my books, perched in my eyrie in Anne’s Corner, because I managed to pass the Law Society’s Final Examination at my first sitting in February 1952, and was even awarded Honours, much to everyone’s astonishment (examinations have always tended to flatter the extent of my true underlying degree of learning). And so I became a solicitor and now the deferment of my national service came to an end. I managed (by a wangle) to get into the Royal Navy and was sent to Victoria Barracks, Portsmouth to start my training. And so I left Chesham Bois behind for two years. The village changed a bit in those two years (how I spent those two years is another story) but when it was over I returned to my family home at Anne’s Corner, Chesham Bois and having got a job as a solicitor in London, I resumed life as a young man more or less as it had been before I went away, except that I was now self sufficient, earning my own living, and had to pay my mother something each week for my keep. My social life resumed its former jolly way but it was never quite the same as in former days. I had wider horizons. I went out to theatres and good times in London with friends from wider afield than in the former days. And so ended my familiarity with Chesham Bois, no longer where my home was. A few years later, my father died at Anne’s Corner, my mother continued to live there alone for a short period of time but then she went to live with one of my sisters at Lyndhurst in the New Forest. My wife Judy and I came back to Amersham a year or so later but this time to Old Amersham where I have lived ever since. Judy died of cancer in 1986 and I married a second time two years later. Whenever I pass through Chesham Bois I still like to glance up at the window to our house in Anne’s Corner and remember some of the adventures I enjoyed in those far off days, now more than fifty years ago. Chesham Bois still has a special place in my heart and in my memory.